Your PR team has landed you a live interview on the morning news, or a coveted sit-down with the editor of the daily paper. You have a few media appearances under your belt, so you should be ready for this one — right? Not necessarily. Flawless media interviews may look easy, but in reality, most spokespeople don’t roll out of bed ready to spout off-the-cuff sound bites and insightful commentary. Even the most seasoned spokesperson needs to prepare to ensure a successful outcome. Run through these tips to get ready for the big day. To prepare for a media interview, you need to look both outward and inward. Familiarize yourself with the reporter and media outlet, as well as your own brand and products. Flawless media interviews may look easy, but in reality, most spokespeople don’t roll out of bed ready to spout off-the-cuff sound bites. Gather background info about the media outlet and reporter, including past coverage about your brand and industry. Is the media outlet known for its “gotcha”-style reporting, or are they a fairly neutral source? Is their audience comprised of high-level business executives or consumers? This info will help you anticipate and prepare answers to expected questions. Go into every media interview with three or four succinct key messages, or “must-airs” in your back pocket. Your key messages should be carefully crafted to address the audience and specific purpose of the interview. Practice saying the messages in a way that is comfortable for you, without sounding rehearsed. If you’re promoting a new product, your bullet points should include key features and tie in your brand’s mission as it relates to the product. If you’re talking about a recent PR incident that spawned negative publicity, develop messages that speak to your company’s core values and address the situation appropriately. When scheduling an interview, you should have some idea about what the reporter will want to talk about. Your background knowledge of the reporter and media outlet will also shed light on what types of questions you can expect. Work with your PR contact to practice answering many different types of questions. Don’t skip the basics — you’d be surprised how often “What is your role at Company X?” trips people up. Challenge yourself to respond to the most difficult questions to make sure you’re prepared for anything the reporter throws your way. If news breaks just before your interview, be aware of how it may affect what you are asked. If your company’s stock price takes a sudden dip, a scheduled discussion about your new office opening may suddenly include a digression into company financials. What do I wear to a media interview? Deciding what to wear for your media appearance can be almost as stressful as the interview itself. Consider the following when selecting your wardrobe. 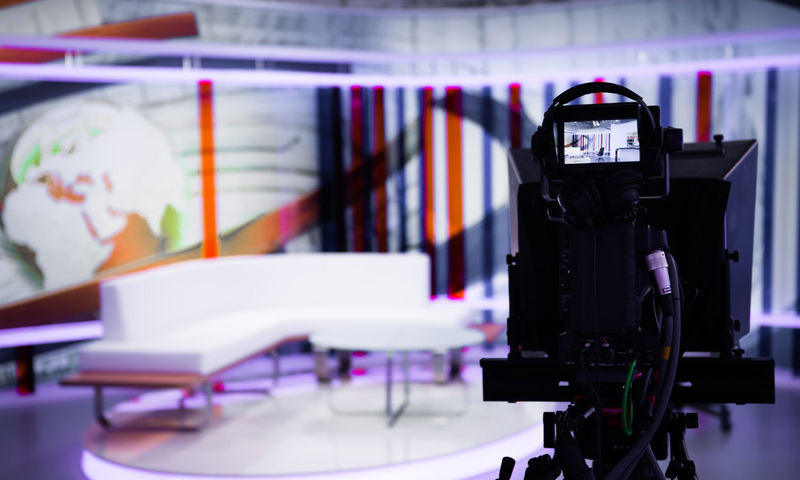 For a live broadcast, choose something professional but comfortable that won’t require constant adjusting, and remember that you’ll probably be wearing a small mic on your collar. Stay away from thin stripes or small prints on camera. Bring face powder, just in case. For a print interview, dress as you normally would for the office, but keep in mind that the reporter may want to take an impromptu photo of you. If you’ll be on camera, will you be sitting or standing? This may affect whether you decide to wear a dress or pants, or how your shirt will be tucked, or whether your coat will be buttoned or unbuttoned. If you’re sitting, keep in mind that your socks may show. Some may remember when BP CEO Tony Hayward infamously wore a crisp white shirt and light linen slacks to visit the site of the 2010 Gulf oil spill. If you’ll be discussing a serious subject, subdued colors may come across better than bright or sparkly outfits. When all is said and done, and the reporter has filed his or her story, don’t forget to look back at how you performed. Did you weave your key messages into your answers? Were you prepared to answer tough questions? Evaluating your performance is essential to evolving as an effective spokesperson. What do you do to prepare for a media interview?